Food teaching progression chart – a chart of knowledge and skills for pupils aged 5-11 years to support teaching about healthy eating, cooking and where food comes from across the UK. Action cards – photos of different food preparation skills. Equipment cards – photos of different cooking equipment. Ingredient cards – photos of different ingredients. 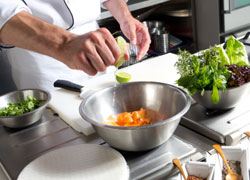 Skills guide – a guide to teaching different food skills safely. Risk assessment sample and Risk assessment template – support for creating your own risk assessment. To view more resources, click here. If you are delivering food lessons in a UK primary school, you are eligible for free access to our online course Teaching food in primary: the why, what and how. To register for your free course code, click here.